I love a good workout - especially if it involves some core work. Today I decided I'd share this little routine I've been loving lately as it's so easy to tack onto the end of your workout and can be done anywhere, anytime! Whether you've just finished with a run or a HIIT session, this core workout is super simple but also super effective and can take as little or as long as you like. We've been calling it Core³ because it's three sets of three exercises with a 30 second plank or jog between each set to switch things up and get you off the floor. The moves for this workout are really simple (and hence why I love it as I don't even need a piece of paper to remind me!) and can be switched out for your favourite ab/core moves if you can't master any of them! See below for one of my favourite switches! Lay on the floor with your fingers just behind your ears and your elbows pointed out. Place the soles of your feet together with your knees pointed outwards. Tilt your chin slightly forward and squeeze your abs to lift your chest upward. Reach up as far as you're comfortable, keeping your abs engaged (if you can, try and reach your knees to your elbows) and then slowly lower down before repeating. Note: make sure you're not pulling your neck up with your hands as you don't want to end up straining your neck! Start by lying on your mat with your arms extended overhead and your feet flexed. As you inhale, tuck your chin in, lift your arms up and use your core muscles to raise your body up. Once you've raised your body to about a 90 degree angle (sitting up), slowly roll your spice back down, keeping your abs engaged, and bringing your body back to the initial laying position. Repeat, making sure you engage your core muscles the whole time. Slow and steady wins the race with this move as it's all about using your abs to lift and lower your body. Start by lying on your back with your feet off the floor. Place your hands behind your head and bring your head, neck and shoulders off the mat. Bring one knee in and reach your opposite elbow in to meet it before taking both your knee and elbow back to the original position. Repeat on the other side in a criss-cross motion to work your obliques. 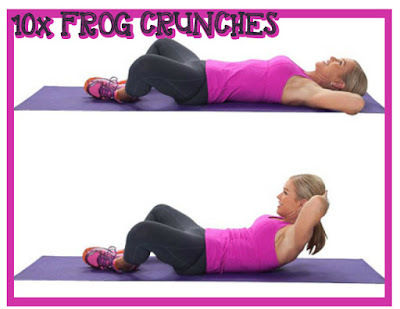 I switch the frog crunch out with v-sit toe touches, however, I discovered they're technically not a thing as I couldn't find any instructions anywhere. Basically, if you want to swap the frog crunch out for those, lay on your back with your legs in a v shape (on the ground) and your arms outstretched over your head. Lift up to grab one foot with both hands, using your core muscles to pull you up each time and then lay back down again with your hands outstretched, giving your core a nice big stretch as you do so. Alternate between legs, reaching for the left toe then the right toe etc. Break things up between sets and get your heart rate up with either a 30 second plank or 30 seconds of jogging on the spot! Repeat the full set x3 (or more!) and you've got yourself a pretty awesome ab workout. 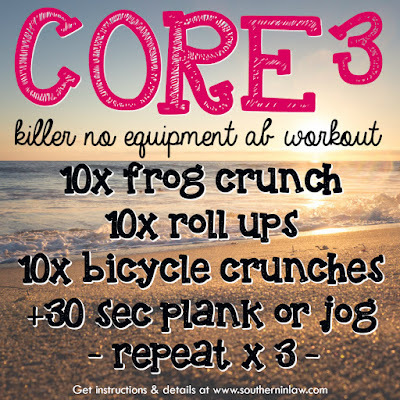 Core strength is so important and this is an easy peasy way to work those muscles! But tell me, what's your favourite way to sweat right now? What workouts are you loving?